Take 1 Thing Off Your Holiday To-Do List & Hire a Pooper Scooper! The holidays are in full swing and while it is a (mostly) wonderful time of year for people, pets can feel differently. 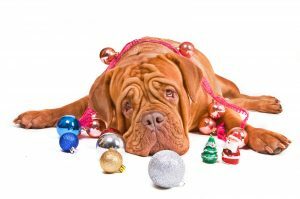 There are many things that occupy pet owners time during this season from shopping to cooking to celebrating but dogs still need attention, especially those that suffer from stranger or separation anxiety. Below are some suggestions that will keep your pet happy over the holidays, and might we also suggest hiring a reliable and surprisingly affordable pooper scooper, like Scoopy Doo’s of Longmont, to make your life easier during this busy time of year! Try your best to stick to your normal routine. Feeding, walking and letting your dog out to potty as close to the same times as possible everyday will help immensely to prevent anxiety. Be sure your pooch wears their collar and tags at all times just in case they slip out as guests and deliveries come and go. If you have family or friends staying with you, keep your pet’s crate or bed in a quiet area where they feel safe to escape to if feeling nervous or overwhelmed. If you will be away from home for extended periods of time, leaving toys and treats to occupy your dog will avoid boredom and coming home to damaged things you didn’t want chewed. Remember that some holiday treats are toxic for your dog, such as chocolate, grapes or raisins, coffee and alcohol! If your pet is young or curious, you may want to keep ornaments out of their reach as well. We wish you safe and happy holiday celebrations, and would also like to say thank you for letting us enjoy your pets this past year! 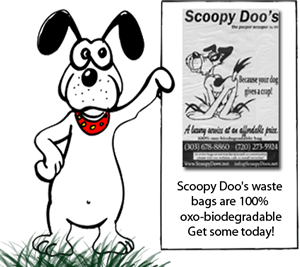 All of us at Scoopy Doo’s in Longmont look forward to continuing to be your reliable pooper scooper in 2018!